Battle for survival on Skull Island in first-person as Jack Driscoll and experience the staggering power of King Kong in third-person taking on massive beasts. 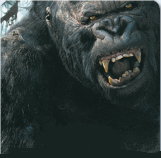 King Kong is one of the most powerful of all the creatures on skull island and players will learn first-hand what it means to be feared, respected and dominant. Kong will use both his agility and his raw, brute strength by any means necessary to battle enemies and navigate through the perils of skull Island. Journey through the explosive action of all the key movie moments, as Jack and Kong, and even explore the beautifully-rendered mysterious jungle environments not seen in the film.